Many of the things Jesus-mythicists claim about Zoroaster—more so than their other savior-figure choices—are actually true and confirmed by scholarly literature, and a couple of them do come from sources that Zoroastrian scholars suggest go back to a source predating Christianity; however, that’s the mythicists getting 10 out of 100 on a test where before they got zeroes. Many of the claims still find no confirmation at all; others come from sources that are way, way too late…even as late as the 10th century A.D.! 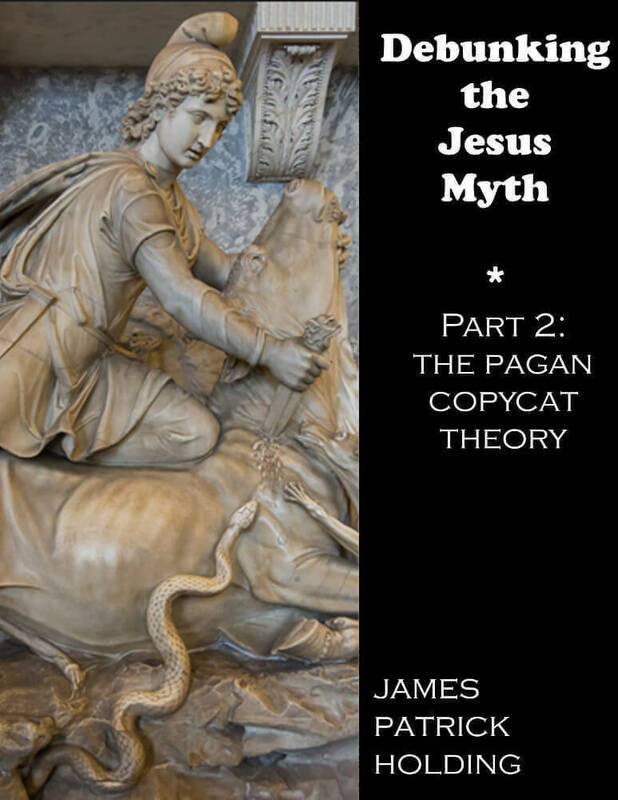 In other words, if we see a “Jesus-like” story in these texts, especially this late, we have a right to suspect borrowing—but in the wrong direction to be of any assistance to mythicists. There is something like this in the literature. The Avesta (note again, a late source, later than Christianity) refers to a “kingly glory” that was handed onward from one ruler to the next. This glory resided in Zoroaster’s mother for about 15 years, including during the time she was married to Zoroaster’s father, Pourushaspa. It seems that a human father was still needed for Zoroaster, and that this “ray” was merely for the infusion of Zoroaster’s spirit, not his body. I can find no such reference. There is a story of Zoroaster receiving a revelation from an archangel while on the banks of a river, which Zoroaster later crosses, but that is as close as I have found. This is true, but unfinished: At age 7, Zoroaster was placed under the care of a wise man, and as he was raised he had disputations with the magi—the practitioners of occult, magic, necromancy, and sorcery. These were “put to confusion” by him. Later, he also made sport of the wise men of King Vishtapsa, who became one of his major converts, and these wise men plotted against him, accusing him of being a necromancer. Zoroaster was imprisoned but got out when he helped heal the king’s favorite horse by making its legs grow back. Zoroaster was clearly a prodigy, but in quite a different area than Jesus. This one is sort of true. After 10 years (not 40 days) of visionary experiences, a minor demon was sent by Ahriman (the functional devil-equivalent in this context—he didn’t come himself) “to deceive and overthrow the holy messenger.” This temptation involved an attempt to persuade Zoroaster to renounce the “good religion” of Mazdeism and worship of evil spirits—no bread to stones, no leaps from towers, just talking back and forth with Zoroaster quoting Persian scriptures. Jackson and Waterhouse indicate no location for this; it could have been the wilderness, but it might have been somewhere else. The story has some roots to the 2nd century B.C., but it bears at best a superficial similarity to the temptation of Jesus. This one is absolutely right, but rendered meaningless in this context by two things. First, it comes from the Pahlavi literature, which is post-Christian by several centuries; second, thirty is the reputed age at which Iranian men come to wisdom. The ancients gave as much regard to the “big three-oh” as we do—no reason to posit influence here. This is an odd claim, because this would equate with a “John the Baptist myth,” not a Christ myth! Even so, I find no such evidence. Zoroaster did have an association with sacred fires  that were part of the fire-cult in three particular temples, and seemed to have taken a part in preserving the fire-cult (which liked to keep the fires going, sort of like our eternal flame at Arlington Cemetery), but he did not “baptize” with and of these things. This is true, but not all of these terms have the same meaning in Zoroastrianism as they do in the Judeo-Christian tradition. Only “resurrection” is a good match here. Zoroaster’s faith taught that after judgment, the “dead will rise up” and men will become “not-aging, not-dying, not-decaying, not-rotting.” In terms of the rest, there are not a lot of similarities. Salvation was by works alone; there was “practically no place for repentance or pardon,” and “no doctrine of atonement.” There is some issue about the fate of the wicked; one account says they will be tormented three days, then returned to do good deeds; another source says they will be annihilated. There is an essential equivalent to Heaven and Hell, but it wouldn’t be too hard to create such a concept independently based on the simple assumption that people will get what they deserve in an afterlife. Judgment would be made by committee: the Persian Mithra and two other gods are on the panel. If you aren’t sure where you might go, Zoroaster himself may come and plead for you. A concept of purgatory appears in a Zoroastrian work of the 5th-6th century, and later Zoroastrianism did develop rites of repentance and expiation, contrary to Zoroaster’s recorded teachings. There is a planned apocalypse to be sure: a flood of molten metal to burn off the wicked. Zoroastrian eschatology comes for the most part, however, from those late A.D. sources. If he did, the Zoroastrian scholars don’t know about it. Not that it matters, since the idea of Jesus having a sacred cup or grail is a product of medieval legend, not the Bible! Zoroaster was indeed said to be slain, but his death isn’t vested with any significance. There are a couple of versions of the story about his death. A late story has him struck by lightning, but that is from a post-Christian source. Another account has Zoroaster killed at age 77 by a wizard/priest. There are no details on his death, other than that it occurred in a temple. A story from the 17th century has Zoroaster whipping out rosary beads and throwing them at his assassin as he dies. No matter what story we accept, Zoroaster’s murder does not have the invested significance of the death of Jesus. However, none of this may matter as Herzfeld, after analysis of the data, concludes that the “murder of Zoroaster is entirely unhistorical,” for the stories of it are all in late sources as much as 1400 years after his time, and had he truly been murdered it would “resound loudly and persistently in history” well before that. Not that the Zoroastrian scholars are aware of, though I would not doubt that the Zoroastrians had communal meals like every religious and political group in ancient times. And since there is no atonement in Zoroastrianism, how can there be a Eucharist? The closest I can find to this is that in later Zoroastrianism, there is a rite involving the intoxicating haoma plant, which may or may not have been known of and/or endorsed by Zoroaster, and involves a daily rite of consumption with no “Eucharistic” significance (that is, it is not Zoroaster’s body or blood). There is also a ceremony that calls the yasna or veneration, which does involve the use of bread (topped with clarified butter), and a drink made from ephedra, pomegranate twigs, and milk (strained through a filter made from the hairs of a white bull), but evidence indicates that this ritual was established as part of liturgical reform in Zoroastrianism in the post-Christian era. Well…not that of which Zoroastrian scholars are aware. Zoroaster’s followers expect a “second coming” in the virgin-born Saoshyant or Savior, who is to come in 2341 CE, and begin his ministry at age 30, ushering in a golden age. True…to some extent. A return is expected in 2341 A.D., to start a golden age; the details on age 30 I have found nowhere. Whether this future Deliverer would be Zoroaster himself is, again, something that has been interpreted, but later Zoroastrian texts think that the person will be of the Line of Zoroaster, not Zoroaster himself. A vague doctrine of a future redeemer does appear in Zoroastrian texts dated as early as the 400s B.C., but only later (9th cent. A.D.) texts go into detail, reporting three world saviors. One will be “virgin born” in a sense: It seems that some of Zoroaster’s sperm is being preserved in a lake in Iran, and three virgins bathing in the lake over the next few thousand years are going to get a big surprise as a result. Virgin born, perhaps, but not virgin conceived. The last of these three redeemers will eradicate all disease and death and usher in the final victory of good over evil. Ernst Herzfeld, Zoroaster and His World (Octagon Books, 1974), 774; John Waterhouse, Zoroastrianism (Epworth, n.d.), 56. Conspiracy theorists should be aware that Alexander the Great and the Muslims were the ones responsible for the destruction of Zoroastrian literature. Interestingly enough, there have even been a few “Zoroaster-mythers.” J. M. Robertson, who also argued for a mythical Jesus and a mythical Buddha, took up the Zoroaster-myth; to which a Zoroastrian scholar responded, “I have myself indeed divined and published the argument by which Mr. Robertson’s successors fifty years hence will irrefutably prove him a myth.” Waterhouse, 11. Jenny Rose, The Image of Zoroaster (Bibliotecha Persica Press, 2000), 17, 27. A. V. W. Jackson, Zoroaster the Prophet of Ancient Iran (New York: AMS Press, 1965), 18, 24. “Immaculate conception,” we may add, does not refer to Christ’s virgin birth, as seems to be the implication here; rather it refers to the Roman Catholic doctrine that Mary was born without original sin. Tony Allan, Wise Lord of the Sky (Time Life Books, 2000), 54. Warerhouse, op. cit., 95, 96, 98, 102. Edwin Yamauchi, Persia and the Bible (Baker: 1990), 465. Notable as well is this commentary: “The case for a Judeo-Christian dependence on Zoroastrianism in its purely eschatological thinking is quite different. And not at all convincing, for apart from a few hints in the Gathas which we shall shortly be considering and a short passage in Yasht 19.80-90 in which a deathless existence in body and soul at the end of time is affirmed, we have no evidence as to what eschatological ideas the Zoroastrians had in the last four centuries before Christ. The eschatologies of the Pahlavi books, though agreeing in their broad outlines, differ very considerably in detail and emphasis; they do not correspond at all closely to the eschatological writings of the intertestamentary period nor to those of St. Paul and the apocalypse of St. John. They do, however, agree that there will be a general resurrection of the body as well as soul, but this idea would be the natural corollary to the survival of the soul as a moral entity, once that had been accepted, since both Jew and Zoroastrian regarded soul and body as being two aspects, ultimately inseparable, of the one human personality.” R.C. Zaehner, The Dawn and Twilight of Zoroastrianism (G.P. Putnam’s Sons, 1961) 57. Note especially the implication that an idea of resurrection could have come up independently in the Zoroastrians because they shared the Jewish perception of totality of body and spirit. Herzfeld, op. cit., 241, 845. Yamauchi, op. cit., 418, 449-50.